Sometimes I find it hard to stop now that I don't have a nine-to-five-type job any more. It's difficult not to feel guilty if I'm not scribbling in a notebook or bashing away at a keyboard or networking or loading the rotten washing machine ... But this weekend I stopped. This weekend I sat down and read a book just for the sheer pleasure of it and I feel so much better now. 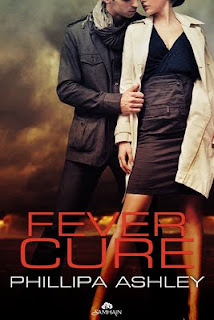 My treat was Fever Cure by Phillipa Ashley. After a year dealing with her mum’s health scare and the end of a bad relationship, Keira Grayson was looking forward to kicking up her heels at her best friend’s wedding. Until she kicks off her (spare) knickers in front of the trifecta of perfection. Tom Carew. Son of an earl, honorable doctor and possibly the hottest man on the planet. One look at Keira’s delightful embarrassment, and Tom’s hormone meter spins off the charts. Trouble is, his bags are already packed to return to the jungles of Papua New Guinea. He has patients waiting—and amends to make for a terrible choice that left devastation in its wake. They both reason that indulging in a one-time dinner date won’t hurt…until their inhibitions melt away in the heat of their lethal sexual chemistry. Leaving Keira wondering if a sizzling fling is just what the doctor ordered, or another prescription for relationship disaster. And Tom fighting a battle against inner demons that could shatter both their hearts. I can't pretend I haven't been waiting for Phillipa Ashley's next book with huge anticipation, because I love her writing. Fever Cure didn't disappoint - it was fab. I just hope she can write fast because I want the next fix now! You can visit Phillipa as well on her blog. I know she'd love to see you there.